I cut out each half with a jigsaw. Next I gathered a pile of reclaimed wood and trim pieces. I painted these orange, green, turquoise, and white. I sanded them when they were dry. I placed the pumpkin halves face down on my workspace and then put the boards face down in the order I wanted and secured them with screws from the back. A little Minwax Puritan Pine stain over the whole thing completes this fresh, reclaimed, salvaged wood pumpkin--a perfect fall decoration! Now, it is time to visit the other 8 fantastic bloggers and see their ideas! 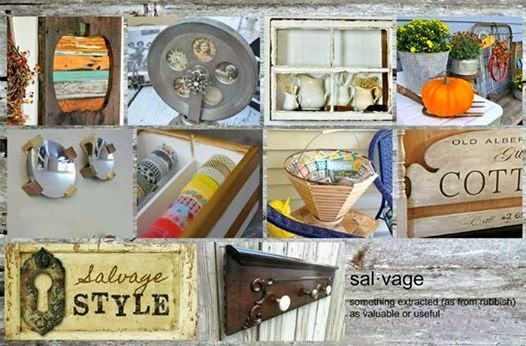 We will be pinning your Salvage Style ideas that you link up HERE--be sure to check out some of our favorite projects we have already pinned and follow the board so you don't miss anything! 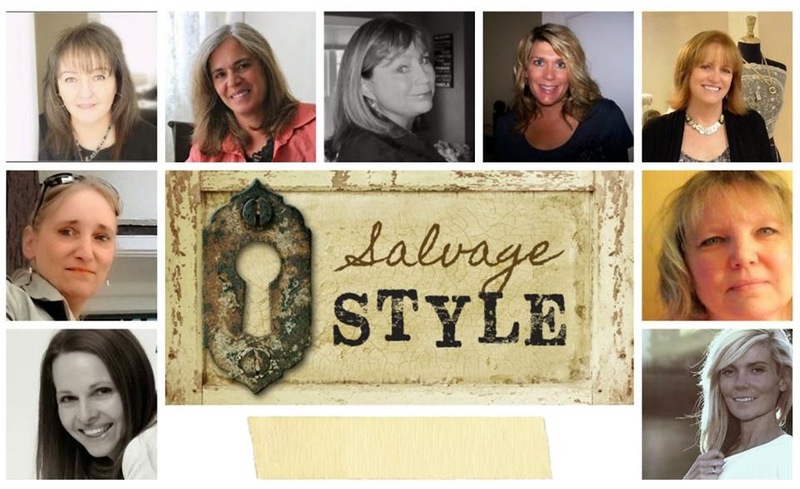 Thank you Kerryanne from Woodberry Design for creating our lovely Salvage Style logo. 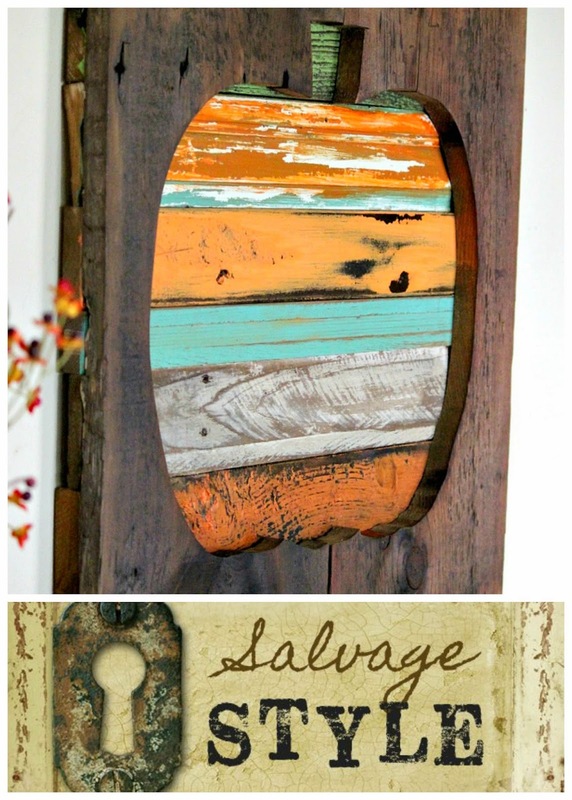 And now it is your chance to link up your own Salvage Style projects. Please make sure projects are fairly current, YOUR OWN IDEA, and please provide a link back to Beyond The Picket Fence. Love your salvage style pumpkin Becky!! The pumpkin is great, and thanks for a great party! 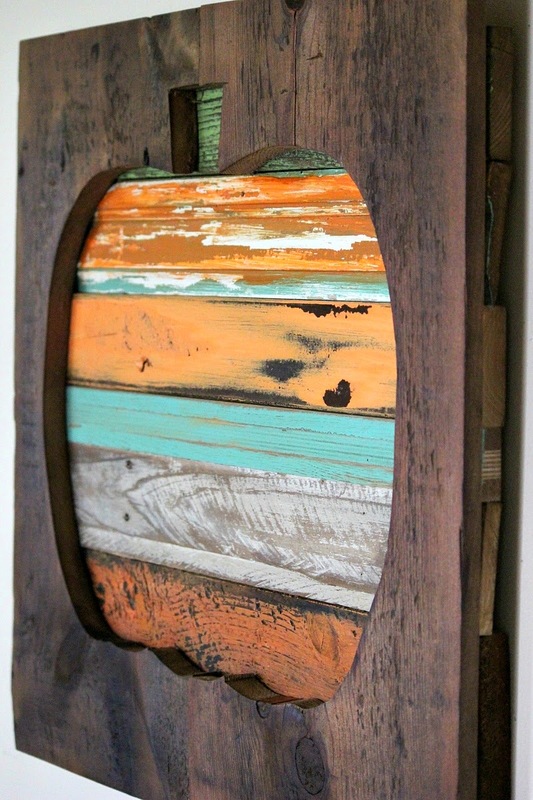 Becky, I love your salvaged wood creations. The orange with the turquoise board is perfect! Really a great project! I have had fun visiting several of the blogs but your pumpkin is my favorite...I love love this piece! Again, you have made something beautiful out of discarded materials....junk! You amaze me.. You are a very gifted creative lady.. Blessings! Becky you are the queen of creativity! And color. And I LOVE your pumpkin! I think I need one, really....it makes me happy! Becky, this is beautiful. I agree with the others, the colors you used are perfect, but then they always are. Great project! The pumpkin cut out is such a nice variation on the theme. And I love the colors of the reclaimed wood. Lovely project. Adorable. I want to make something with that reverse cut out process. I better get cracking before Fall is over. I love this -- esp. the color combos!